7 weeks ago I started painting Savs big girl room. It took me a ridiculously long amount of time to piece together this space. I wanted it to feel grown up, without being too grown up. I wanted it to be sweet but simple. I wanted it to be chic and dainty while still being a bit rustic. And while I didn't really nail the whole rustic part, I think everything else came together pretty well. 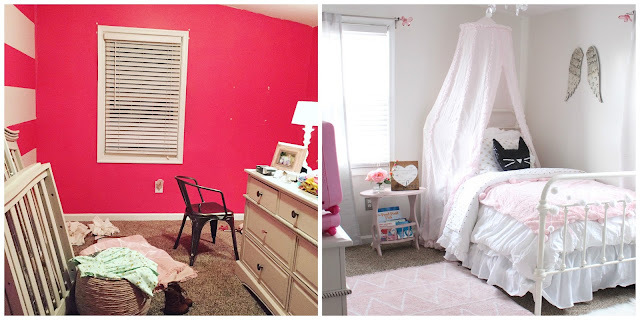 When I painted this room HOT PINK almost 3 1/2 years ago I sort of don't know what I was thinking, her room is already super small, and the dark color just really made the room look smaller. So I knew this time around, I wanted to make this room as bright as possible. I searched and sampled SO MANY WHITE PAINT COLORS. SO MANY COLORS. Until I finally decided on Benjamin Moore's White Cloud. I'm so happy with this choice. The color is soft, and warm without being yellow. It almost has a grayish tint to it. It's a really great neutral and perfect for small spaces. After successfully painting this room, I've decided I need to paint another room white, like. Yesterday. The elements of this room are super simple (with a little bit of glam touches, because well, that's what I do here at TGF.) Most of it was built around the bed which I got at Joss & Main. I loved the timeless look of it, and it sort of reminded me of the shabby chic country look I was going for. I was able to snag it for a really great deal! I loved the whole Shabby Chic bedding line from Target and the curtains and white bedspread are both from there. I kept the curtain finals from her nursery because they're pink and seem to go with the room okay. I searched high and low for a pom pom throw and eventually, found this super cute one from Pottery Barn Kids. 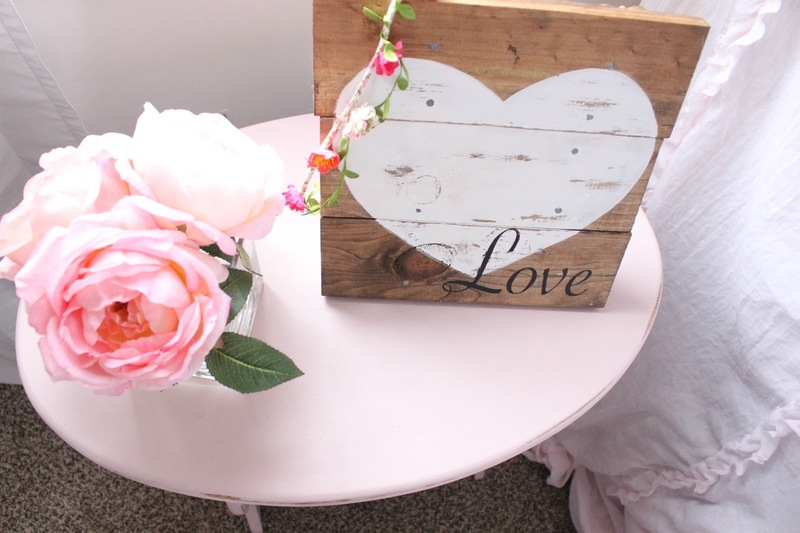 Super soft and the perfect dose of pink for the space. 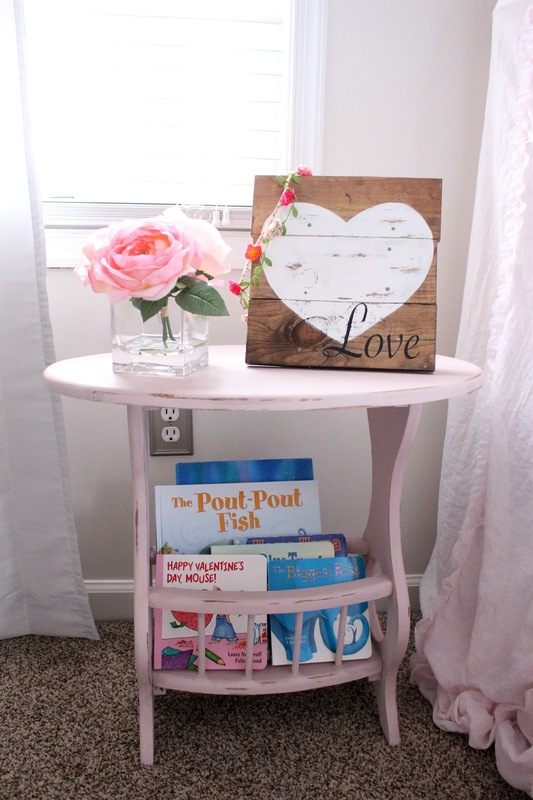 I was so excited to finally have an excuse to paint one of these side tables that I've had in the garage now for a few months! It fits perfectly in the space, don't you think?! My original plan was to do an ENTIRE wall, with the gold heart decals, but they were like $24.99 a pack and in the end I decided I just didn't want to spend that much. So, Instead, I just did this little space. I was hoarding the gold S for awhile, I picked it up at clearance at Home Goods, with the intentions of painting it for our main living space. It ended up working perfectly right here in miss Sav's room! The White Curtain hides the closet. This room is really small so I knew we couldn't do a closet door, but I also knew I couldn't sacrifice closet space, It's tiny, but it works. I have a storage cube in there to really maximize it. I've really been into mis-matched hardware lately! Oh, and glass jars. And Mercury Glass. And White..and..okay, I'll stop now. The Garland is from Savs FIRST Birthday party! I just can't seem to part with it! My Dad built the white shelf, originally for my living room, but I decided it would work perfectly here and it's where we keep all of Savanna's Disney and trip souvenirs! Oh, and let's all stop for a minute to admire miss Savanna's photography skills. She LOVES getting out the tripod (even though I never really use it!) She is totally my twin! Every single time Savanna goes into her room now she just ooh's and ahh's at it. She says she loves her "princess room" and I'm hoping she digs it for awhile! and because this post just wouldn't be complete without a before & after..here you go. Pretty awesome what some paint can do, huh? How are we feeling about white walls in general right now? Shoot me a message on Instagram or right here below! Always love to hear from you guys!! This is just gorgeous!! Where did you get the gold heart decals?? 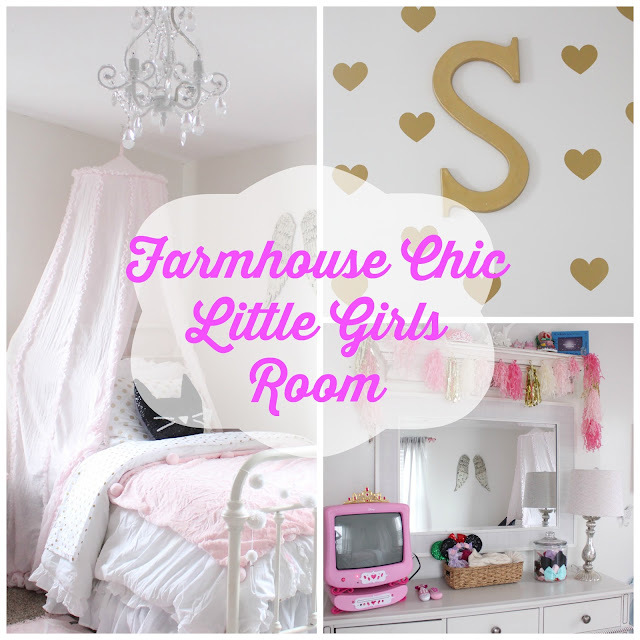 I would love to have those for Olivia's room one day! I have seen the gold polka dots, but never hearts! Her whole room is just perfection. So funny about the garland from Savanna’s first birthday party - when I decorated Mila’s new room, I used a banner from her first birthday party as well! Hey if it works, you might as well use it, right?? Her room looks amazing! I especially love her bed and bedding. And that chandelier! Great job putting it all together! What a transformation! I think this turned out amazing! What a special space for a special little lady!!! Who wouldn't want a room like that!